The Deep-Sea Monster Raiga sits down to discuss his film with Gretchen and Kyle. This month, Gretchen and I are discussing an independent kaiju comedy called Deep Sea Monster Raiga (2009) by Rakugo performer and general awesome dude, Shinpei Hayashiya. There’s so little available on this film (at least in English) that I asked a special guest to join me for part of the episode. 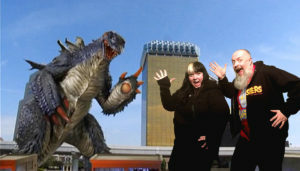 Who better to turn than the man behind the independent documentary on independent kaiju films than Mark Jaramillo? 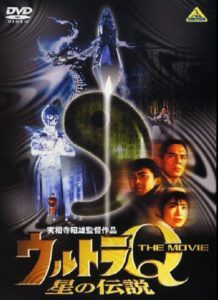 Ok, this has been a long time coming, but we are going to finally be watching Ultra Q The Movie: Legend From The Stars. This is a film that I’ve wanted to watch for quite some time but a subtitled copy has never made it’s way into my hands. Yep, that means we’re going to try and cobble together what’s happening in this rarely seen Tsuburaya flick by using our brains and deductive reasoning. I’m almost positive that no one else in the HQ has seen this one, including me, so I’m as I said in the episode, I can’t wait to see what this movie is going to be like. Again, there’s no English subtitled version (or dubbed for that matter) that I could find, so we’ll be watching it on Youtube ( <- that’s the link). If you’d like to have your homework turned in for this entry, make sure to send in your thoughts, questions and reviews for the discussion episode before November 24th. Thanks!